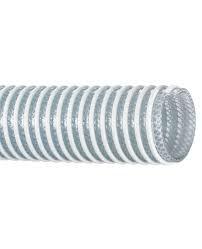 Heavy duty food grade suction and discharge hose is produced entirely of compounds in compliance with FDA and 3-A nontoxic specifications, flexible PVC, rigid PVC helix, synthetic braiding, smooth bore, corrugated O.D. Kanaline FW is a lightweight and flexible, and the external helix allows you to drag the hose without damaging the rubber part of the hose. A clear sidewall permits a visual check of the process flow. NOTE: Banding coil must be used for all sizes if self banding.